See two of Vietnam's most popular tourist attractions in this exclusive day tour! 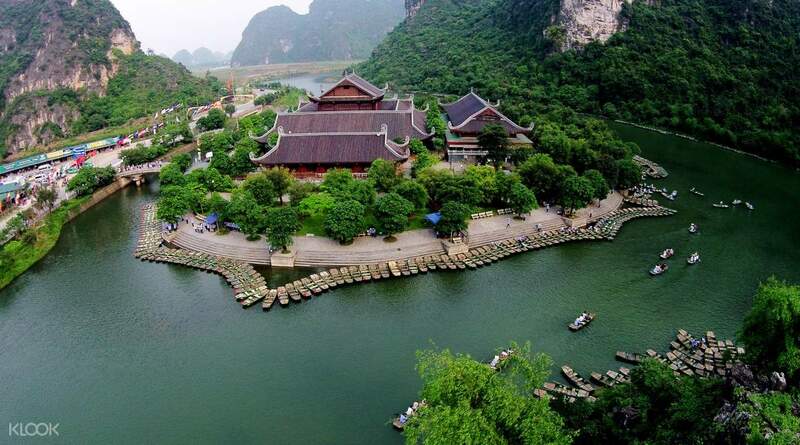 Get a chance to see the Trang An Tourism Complex, popularly known as a UNESCO World Heritage site! Pay a visit to Bai Dinh Pagoda, the largest complex of Buddhist temples in Vietnam! The tour guide speaks pretty good English with sense of humours. The boat ride is enjoyable. Recommend! See the best of Vietnam when you book this exclusive tour to Bai Dinh and Trang An! Explore two of the most famous tourist attractions in the country and discover why tourists from all over the world flock to these local spots. Start your tour early with a bus ride from Hanoi to Bai Dinh Pagoda. Relax on the way as the bus is fully air-conditioned and the seats are all cushioned. Once you reach Bai Dinh Pagoda, you'll be amazed by the colossal size of the complex. 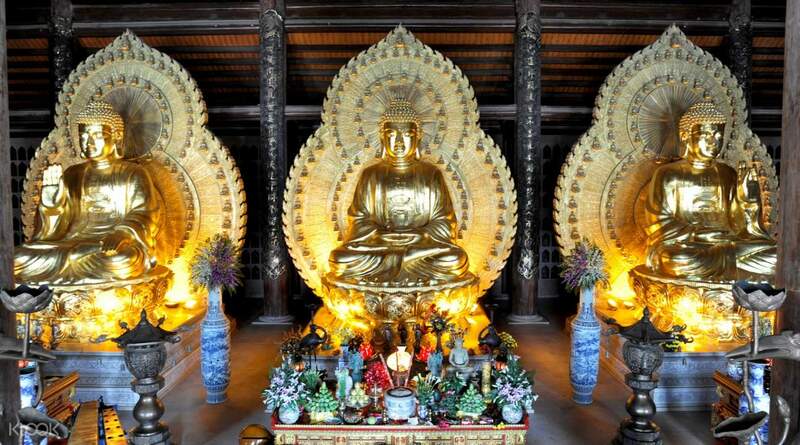 Known as one of the biggest pagoda in the world, Bai Dinh Pagoda houses the biggest bronze Buddha statue in Vietnam. At 10 meters, the bronze Buddha stands tall among hundreds of buddha status in the property. After an educational tour around the 700-hectare Buddhist temple, the tour will then take you to Trang An Tourism Complex. To tour the UNESCO World Heritage Site, you'll have to ride a rowboat inside. Visit Sang Cave, Toi Cave, Ba Giot Cave and Nau Ruou Cave - a network of majestic caves. Enjoy the unique combination of deep turquoise river water between mountains, water caves and clear blue sky, all at Trang An. Book now for an amazing trip to Vietnam's cultural heritages! 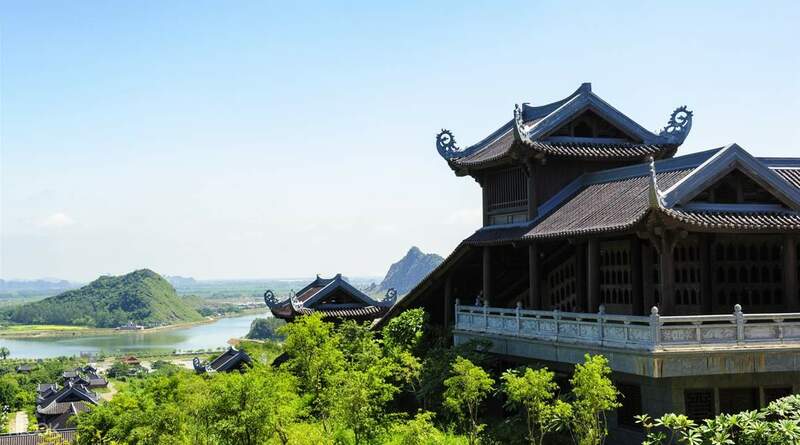 Get lost inside Bai Dinh Pagoda's 700-hectare property! Explore Trang An's intricate cave complex on a rowboat paddled by locals! The pagoda complex is massive & the boat ride is the highlight of the tour. We started a bit slow, we spent 1.5 hours at the pagoda, lunch at 1.30pm but that's fine as we then got to do the boat ride in the afternoon (3-5pm) so it's not as hot as mid day. Bring snacks & drinks for the journey, especially if you have kids because lunch & dinner is a bit delayed. The pagoda complex is massive & the boat ride is the highlight of the tour. We started a bit slow, we spent 1.5 hours at the pagoda, lunch at 1.30pm but that's fine as we then got to do the boat ride in the afternoon (3-5pm) so it's not as hot as mid day. Bring snacks & drinks for the journey, especially if you have kids because lunch & dinner is a bit delayed. It's a nice trip. First we went to Bai dinh pagoda. Bai Dinh Pagoda is Southeast Asia’s largest Buddhist complex. It consists of several temples and over 500 intricately carved statues of Buddha, including one that’s made of bronze and is 10 metres in height. Set within the Gia Sinh Commune, it attracts a huge crowd of local devotees and travellers looking to pay their respects and have their fortunes told by the resident monks. Then we went to Trang an boat trip. Many caves and beautiful natural greenary. It's a nice trip. First we went to Bai dinh pagoda. Bai Dinh Pagoda is Southeast Asia’s largest Buddhist complex. It consists of several temples and over 500 intricately carved statues of Buddha, including one that’s made of bronze and is 10 metres in height. Set within the Gia Sinh Commune, it attracts a huge crowd of local devotees and travellers looking to pay their respects and have their fortunes told by the resident monks. Then we went to Trang an boat trip. Many caves and beautiful natural greenary. A fantastic day! Our tour guide Kimi was fantastic; friendly, funny and knowledgeable. The trip from Hanoi to Ninh Binh is around 2 hours depending on traffic, but it’s a great opportunity to see the more rural areas between the two places. Bai Dinh temple is just incredible with some beautiful views to be had. The riverboat trip is very tranquil, a welcome break from the busy city of Hanoi. The landscape surrounding you is just sublime, however it’s worth noting that (as you’d expect) there are many other boats. If you want a less busy experience, book during the week. I went on a Monday and the waiting time for a boat was about 5-10 minutes but peak times this is much, much longer. Overall a great day and excellent value! A fantastic day! Our tour guide Kimi was fantastic; friendly, funny and knowledgeable. The trip from Hanoi to Ninh Binh is around 2 hours depending on traffic, but it’s a great opportunity to see the more rural areas between the two places. Bai Dinh temple is just incredible with some beautiful views to be had. The riverboat trip is very tranquil, a welcome break from the busy city of Hanoi. The landscape surrounding you is just sublime, however it’s worth noting that (as you’d expect) there are many other boats. If you want a less busy experience, book during the week. I went on a Monday and the waiting time for a boat was about 5-10 minutes but peak times this is much, much longer. Overall a great day and excellent value! our tour guide Kimmy was very funny and helpful, he introduce us the complete itinerary and gave us some useful tips about vietnam, very friendly guide and we enjoyed our tour and get to meet some people along way. the buffet food was good, the bus we rode was clean and fully air conditioned! our tour guide Kimmy was very funny and helpful, he introduce us the complete itinerary and gave us some useful tips about vietnam, very friendly guide and we enjoyed our tour and get to meet some people along way. the buffet food was good, the bus we rode was clean and fully air conditioned! Bai Dinh Pagoda and Trang An are one of the must see places when in Hanoi. We were picked up by our tour guide Ms.Lily, an energetic and well English spoken guide. About: We were a total of 28 people on the bus excl Guide and Driver. Lily briefed us about our itinerary. We first went to the Pagoda, it was beautiful, after the Pagoda visit we went to a restaurant with Buffet lunch- good food (veg & non veg) and then we went to Trang An. Trang An was AMAZING. It’s often under rated, therefore you must visit to understand the beauty. We were 4 in a boat excl the rower (Lady). It’s amazing how these lady rowers row for 2.5 hours continuously. There are many spots for stopovers, but we were stopped at the famous King Kong Island, and the lady again picks you up and drops off to our destination. It was worth the money and time. Cons: there aren’t any actually, the guide was a really helpful person, and very responsive to everything. Probably the driver takes about 2.5 hours one way for a 80km ride, so planning your day would be helpful. Bai Dinh Pagoda and Trang An are one of the must see places when in Hanoi. We were picked up by our tour guide Ms.Lily, an energetic and well English spoken guide. About: We were a total of 28 people on the bus excl Guide and Driver. Lily briefed us about our itinerary. We first went to the Pagoda, it was beautiful, after the Pagoda visit we went to a restaurant with Buffet lunch- good food (veg & non veg) and then we went to Trang An. Trang An was AMAZING. It’s often under rated, therefore you must visit to understand the beauty. We were 4 in a boat excl the rower (Lady). It’s amazing how these lady rowers row for 2.5 hours continuously. There are many spots for stopovers, but we were stopped at the famous King Kong Island, and the lady again picks you up and drops off to our destination. It was worth the money and time. Cons: there aren’t any actually, the guide was a really helpful person, and very responsive to everything. Probably the driver takes about 2.5 hours one way for a 80km ride, so planning your day would be helpful. Fantastic tour. Well planned. Bai Dinh is huge. There are more than 500 statutes of "Amidha" - monks who had attained stage between human & Buddha. They are lined along the corridors of the huge pagoda ground. Buffet lunch is sumptuous. must try the mountain goat soap. Boat ride in the Tran An complex is fantastic. The scenery is far better than Ha Long Bay. You get to see the see the hills & caves up close. The female boat rower skillfully navigate the boat through the various caves. At some points, it felt like one would hit the cave ceiling & instinctively ducked. The tour is definitely worth every penny. Fantastic tour. Well planned. Bai Dinh is huge. There are more than 500 statutes of "Amidha" - monks who had attained stage between human & Buddha. They are lined along the corridors of the huge pagoda ground. Buffet lunch is sumptuous. must try the mountain goat soap. Boat ride in the Tran An complex is fantastic. The scenery is far better than Ha Long Bay. You get to see the see the hills & caves up close. The female boat rower skillfully navigate the boat through the various caves. At some points, it felt like one would hit the cave ceiling & instinctively ducked. The tour is definitely worth every penny. The best activity we did in hanoi. Trang an is so underrated. We find it actually much better compared to halong bay. Fun fact is that trang an is the shooting location for the King Kong movie (Skull Island). No tourist traps as well and they aren’t pushy when it comes to tips. The best activity we did in hanoi. Trang an is so underrated. We find it actually much better compared to halong bay. Fun fact is that trang an is the shooting location for the King Kong movie (Skull Island). No tourist traps as well and they aren’t pushy when it comes to tips. 2-hour ride to destination from pick-up point. We had a very good tour guide, very attentive and entertaining. Pagoda tour, lunch then boat tour. Love the boat tour, it’s absolutely endearing. Highly recommended. 2-hour ride to destination from pick-up point. We had a very good tour guide, very attentive and entertaining. Pagoda tour, lunch then boat tour. Love the boat tour, it’s absolutely endearing. Highly recommended. We enjoyed the tour very much. The tour guide impart us some quick facts about Hanoi and Vietnam. From history to how to read the Vietnamese letters and how one word can be said in different ways and mean differently. Bai Dinh tour amazed me with the massive Buddha. Little I have known that it exist until the time of our tour. Trang An tour was great and was happy to be in the Skull Island as I saw the movie Kong. We enjoyed the tour very much. The tour guide impart us some quick facts about Hanoi and Vietnam. From history to how to read the Vietnamese letters and how one word can be said in different ways and mean differently. Bai Dinh tour amazed me with the massive Buddha. Little I have known that it exist until the time of our tour. Trang An tour was great and was happy to be in the Skull Island as I saw the movie Kong. Tour guide was very friendly. we first visited the pagoda then visited a lake with limestone mountains surrounding it. it's essentially a halong bay on the land. we took a teo hours ride around the lake and the rower did not ask for tips. they have strict anti tipping policy. you are allowed to tip them though. because after all they rowed for two hours! Tour guide was very friendly. we first visited the pagoda then visited a lake with limestone mountains surrounding it. it's essentially a halong bay on the land. we took a teo hours ride around the lake and the rower did not ask for tips. they have strict anti tipping policy. you are allowed to tip them though. because after all they rowed for two hours!